Clubs throughout New South Wales and Australia play all year round and welcome new players at any time. Club games are usually mixed with Males/Females, Junior, Senior and Elite Players in the pool at the same time. Thinking of joining to try it out? or are you an experienced player looking for a scratch game? On hold pending Pool renovations. All Australian and overseas clubs are invited to join us on the Gold Coast in June. Watch this page for more details on the Club Championships. 02 March 2019 - Congratulations to Dorian Lunderstedt, Andy Davis, Ayden Roberts and Doug Penrose for winning the 2019 Wollongong 4's, in its 25th year. Also congratulations to Ben Stepkovitch for being awarded the Most Valuable Player for the competition. Thanks to the Wollongong Club for organising another great competition. The Wollongong 4's is Australias largest and longest running social Underwater Hockey competiton. Starting in 1992, the competition regularly attracts more than 50 competitiors from all over Australia and beyond. To qualify you need to turn up on time, put your name in the hat and be drawn onto a team with three other players. Then its game on for several hours of four on four hockey. At the end of the day its off to a secret location for Beers, BBQ and Raffle. Watch this page for details on the 2020 Wollongong 4s. As NSW is hosting the Australian Underwater Hockey Nationals in 2020, the organising committee for the Nationals is in the process of securing a pool booking. Once this booking has been secured, the committee will also try to secure the same location for the State Titles. Club contacts will be notified once the booking is made or watch this space for more details. The NSW Elite Mens team have placed 2nd in the 2018 and 2019 Nationals. Will the home ground advantage get them the Gold in 2020? Opportunities exist for new players to join the NSW Elite Womens team for the 2020 Nationals in Sydney. Contact NSW Underwater Hockey for more information. 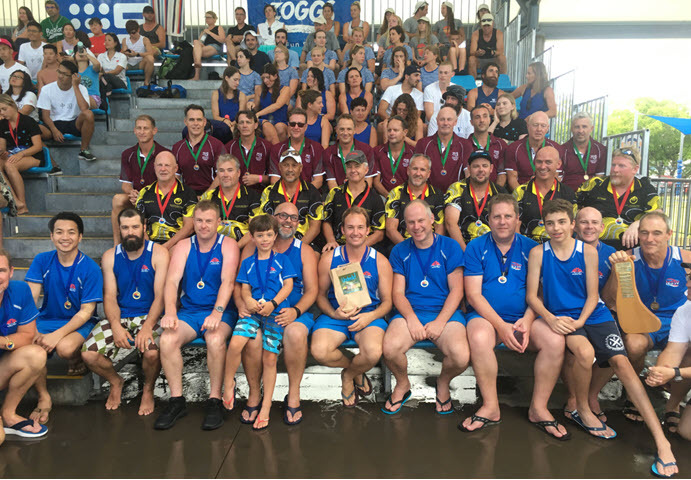 The NSW Mixed Masters team won Gold in the 2017 Gold Coast, 2018 Perth and 2019 Cairns Nationals. Will they be favourites again in 2020 with the home ground advantage? Opportunities exist for new players to join the NSW Under 15s team for the 2020 Nationals in Sydney. Opportunities exist for new players to join the NSW Under 19s team for the 2020 Nationals in Sydney. NSW is looking for volunteers to assist with the 2020 Nationals in Sydney. Administrators, Coaches, Managers and Referees are welcome. Isaak Campbell from New South Wales playing for the Victorian Under 15s in the 2019 Australian Underwater Hockey Nationals. Clubs games are casual - just turn up, join a team, jump in and have a go. In fact this is the case worldwide and websites exist to encourage players to play as they travel. State Champs (representing your club) are casual - we make every effort to accommodate all players and get them on a team. Nationals (representing your State) are serious - you need to make the cut. Worlds (representing Australia) are more serious - The elite mens team is hotly contested and you'll need several years to make it, but it is not uncommon for Juniors to make the National team in their first or second year. A number of clubs also organise social competitions throughout the year with the Wollongong 4's being one of the most popular and longest running. All clubs welcome beginners and learners and if your keen, you can be playing competitions in no time. Use the links at the bottom of this page to contact your local club. Most clubs have loan equipment available until your ready to upgrade and purchase your own equipment. You will eventually need; Mask, Snorkel, Fins, Water Polo Caps (ear protection) and Sticks (Bats). AUF membership is compulsory to play at State, National and International level. It covers the administration of the sport and insurance. NSW Underwater Hockey is affiliated with Underwater Hockey Australia and the Australian Underwater Federation.